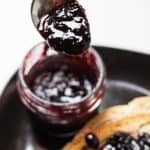 I made this saskatoon jam as low in added sugar as possible while keeping it food safe! The result is a jam bursting with berry flavour! The other day at breakfast I sighed a contented sigh. We had toast, jam, fresh fruit, and coffee. I suddenly realized that this isn’t a breakfast I would normally get excited about. In fact, I’m not really much of a toast and jam kind of girl. But the toast was made with homemade sourdough bread. The fresh fruit was blueberries and cherries, which I only ever buy in season. The coffee was a freshly ground French pressed dark roast. And the jam was saskatoon. The story changes when you’re eating gourmet. And yeah… I also realized I might just be a bit of a food snob! I found myself digging out my old food lab manual to create this recipe. I wanted to make it with as little sugar as possible while still keeping it food safe. The sugar in jams and jellies isn’t just added as a cheap filler to sweeten it. The sugar acts as a natural preservative against yeast, mould, and bacteria. So you can’t just cut the sugar out completely. As far as fruit goes, berries are impressive nutritionally. And as far as berries go, saskatoons are even more impressive! Saskatoons are a good source of fibre, micro-nutrients, and anti-oxidants. Saskatoons are twice as high as blueberries for their anti-oxidant content! Anti-oxidants can help to keep blood vessels healthy thereby preventing heart disease. When you condense the fruit into a jam, you’re going to get a higher concentration of these nutrients. 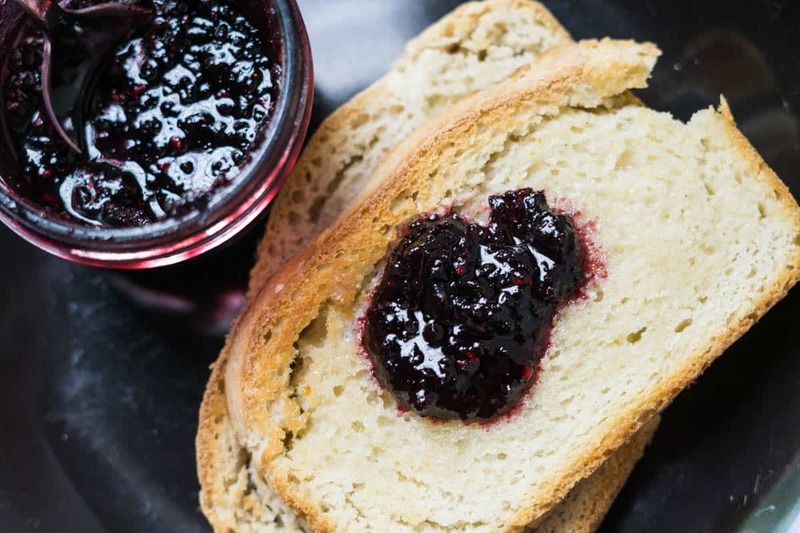 By adding less sugar to the jam than traditional recipes, each bite of jam will have more fruit and therefore, more nutrients such as iron and copper! Using your canning pot, sterilize your jars, lids, and screw tops by boiling in water for 20 minutes. Remove from heat. Remove the jars from the pot but keep the lids and screw tops in the warm water. Place the berries and lemon juice in a blender or food processor. Blend on low or pulse with the food processor until the berries are broken up but not pureed. Look for a chunky texture. Transfer to a large pot. Stir in the pectin. Heat over medium heat until boiling. Stir frequently. Then add the sugar 1 soup ladle at a time, stirring well in between. Return to a boil. Once it’s at a rolling boil, keep it at a boil for 1 full minute. Remove from heat. Fill the jars leaving ¼ inch (0.5 cm) head room (space at top). 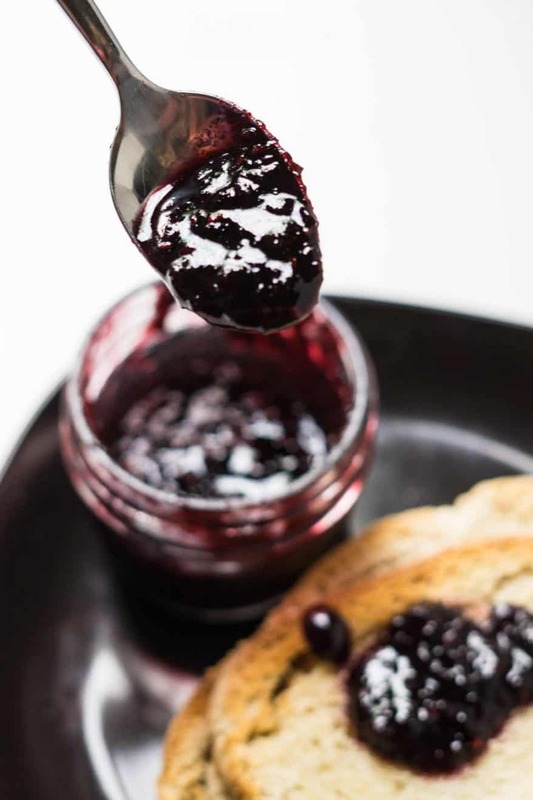 Either use a non-metal utensil to slide between jar and jam to remove air bubbles or gently lift the jar an inch or so off the counter and drop to remove air bubbles. Remove the lids and screw tops from the water. Place the lids and screw tops on the jam jars. Only tighten until finger tip tight. This means just until you start to feel some resistance. You don’t want the lids to be super tight. Return jars to the water bath. Make sure the water level is at least 1 inch above the tops of the jars. Return water to a boil. Once the water has returned to a boil, set a timer for 15 minutes. Remove jars from water and allow to sit at room temperature for 24 hours. Check seals to ensure they have sealed. At this point, you can remove the rings for storage. Fills 12x 125 ml (½ cup) mason jars + extra to keep in the fridge and use within one week. So I made this and I like it a lot because the sugar content is lower but I think the large volume of lemon juice changes the Saskatoon flavour a lot. It also isn’t quite as low sugar as you would think because other recipes call for their volume of berries in the crushed state. This recipe is probably equal parts sugar and crushed berries but that’s a lot better than almost twice the amount of sugar to crushed berries. My husband said this is the best sugar-reduced recipe I have made. Oh, that’s awesome to hear! Thanks for leaving a comment. Tried this and loved it — the flavour was delicious. I did find it a little too firm. Would it be reasonable to add 1.5 pkg of pectin? It’s interesting how people prefer different types of jam; I really like my jam to be firm! Before reducing the pectin I think I would puree the fruit a bit more to make it thinner. Weird question but could you use lime instead of lemon? Yup, that could be an interesting flavour!